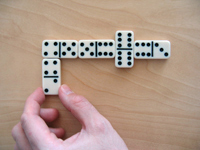 Draw dominoes is the most common game played using dominoes. When someone says, “Let’s play dominoes!” they usually are referring to Draw dominoes. Place the dominoes face-down on the table and mix them up. If 2 people are playing, each player selects 7 dominoes. If 3 or 4 people are playing, each player selects 5 dominoes. Keep your dominoes in front of you but hidden from your opponent(s). Leave the rest of the dominoes face-down on the table in the “boneyard”. The player with the highest double places that double on the table to start the game. If no one has a double, the player with the domino of the highest value starts. The next player to the left must then place a matching domino next to the first domino. For example, if the first player started the game with double six, the next player must play a domino that has a six on it. If the player doesn’t have a domino of matching value, they must pick up a domino from the boneyard. They keep picking up dominoes from the boneyard until they get a playable domino. If there are if no more dominoes left, the player must pass their turn. This diagram shows two ways to place dominoes at the end of the chain. Both ways are correct. 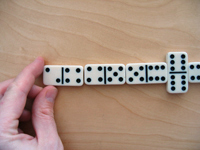 Note that doubles are always placed perpendicular to other dominoes. The first person to run out of dominoes is the winner of the round. If no one runs out of dominoes but everybody passes because they don’t have a playable domino, the person with the lowest score is the winner. The winner scores the total number of points on all of the opponents unplayed dominoes. If the winner has any unplayed dominoes, subtract them from the score. A game of draw dominoes is typically played to 100 points and the scoring is kept with pencil and paper. Some players like to use a cribbage board to keep score. In this case, the game is usually played to 121 points, which represents the final peg hole on the cribbage board. When playing with 4 people, you can play as partners or teams. Partners sit across from each other at the table. Partners add their scores together to yield a team score.